How often do you find yourself going to the post office lately? If you're like me, it's a fairly rare occurrence, especially now that I do most of my correspondence and bill paying electronically. Mostly, I'm there to ship something I sold on eBay, or maybe I'm sending hard-copy writing samples via express mail. I have to admit that when I have time to spare, I rather enjoy going to the post office in my small town. It's old-timey and maintains that feeling of permanence you want in a government building, which so many newer buildings lack. Take a look at the higher reaches inside the lobby area of an older post office, and chances are you'll see some vintage murals. Depending on the location, you might see colonial history, idyllic local scenery, or maybe heroic representations of New Jersey industry. These murals were the product of a convergence of economic hardship, government stimulus and artistic trends in the 1930s. Art - and artists - tend to suffer in poor economies, and the Great Depression was no exception. Among the 'alphabet soup' bureaus created under the Roosevelt Administration were the Federal Art Project, Public Works of Art Project and the Treasury Department Section of Painting and Sculpture, all designed to provide work opportunities to artists while improving public buildings. Murals were particularly popular, as the Italian Renaissance fresco style had come to the fore during the Roaring 20s. Most showed more traditional styles, idealizing American values in the communities where they were housed. They didn't just put the unemployed to work, they help to tell the stories of our past and expose us to fine art at the same time. Nationally, more than 5000 jobs were created through the art programs. 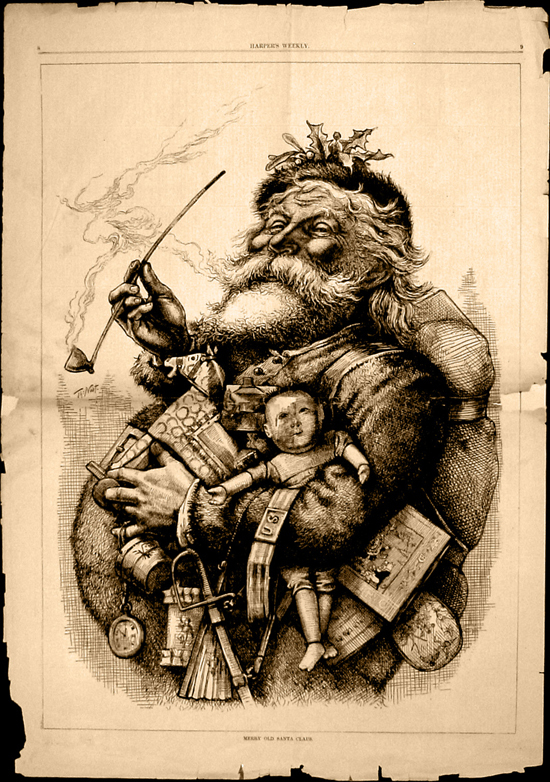 In New Jersey alone, nearly 50 post offices were graced with their work. I do wonder about the veracity of some of the scenes, though. 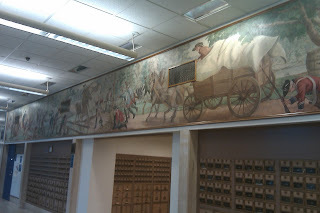 The recently-restored mural at the Cranford Post Office, for example, is purported to depict the Battle of Cranford, a skirmish I've yet to hear of. Yes, troops were cantoned along the Rahway River in the town, but it's not likely they actually fought on town soil. I'm sure the mural has built community pride in our colonial forebears, perhaps it's at the price of accuracy. These days, the murals have likely lost their meaning for many people who see them, but they're worth a look. When they were first installed, they showed a vision of the best of a prosperous and hopeful America. Today, they show the optimism of a people in the depths of economic despair, a people who would enjoy a level of prosperity within a generation. The cold weather brings duck season with it. No, I don't mean the Looney Tunes/Merrie Melodies kind of duck season, wabbit season, Elmer season. I mean the "Wow, did you ever know that so many kinds of ducks come to New Jersey?" I first discovered this on a solo winter trip to Long Beach Island several years ago. Walking on the jetty by the lighthouse, I noticed some beautiful black, white, gray and rust-colored ducks congregating in the waters next to the rocks. Their colors seemed to be applied in blocks, much as one might work a paint-by-numbers portrait. I didn't know at the time, but harlequin ducks can often be found there in the winter, right along the rip-rap that protects the lighthouse property from eroding into the bay. They're a nice diversion from the mallards we're all familiar with. Ivan and I visited Barnegat Light State Park last January to see these and other ducks, but before we got to the jetty, he wanted to stop and pay his respects to George Meade. Huh? Turns out that the designer of the Barnegat Lighthouse is none other than the man who led the Army of the Potomac to victory at Gettysburg and several other Civil War campaigns. Meade was both an army officer and civil engineer who specialized in coastal construction. It was logical, then, that he was the one who designed the successor to the original 40-foot Barnegat light, which had been shoddily built in 1835. Meade's replacement stands a majestic 172 feet, second in height to only Cape Hatteras light on the entire east coast. He used an innovative cylinder-inside-cone design that provides moisture-blocking insulation between the tower's inner and outer walls. While the construction has held strong since the light was first illuminated in 1859, the biggest threat to the tower is erosion to the north end of Long Beach Island, where it stands. That's why the rip rap is there, creating a harlequin-friendly environment not far away. Meade also designed Cape May and Absecon Lights, both of which tower around the 170 foot mark. Depending on who you talk to, you'll hear differing opinions on which is tallest, or which should be considered most challenging in number of interior steps, but all have largely withstood the test of time. 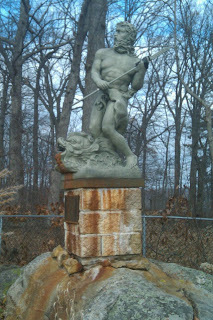 To my knowledge, Barnegat is the only light that commemorates Meade with a bust or plaque. Personally, I think the best homage to him is to climb to the top of his creation, look out to sea and imagine all of the mariners whom it guided safely to port. To many people, the 'end' of New Jersey is Cape May Point, punctuated by the lighthouse. To me, it's East Point, in Heislerville, also punctuated by a lighthouse. Cape May is nice and all, but there are way too many people for it to be the 'end.' The end, to me, is a place where everything stops, and it's just you, nature and a broad expanse of water with no indication of land on the other side. 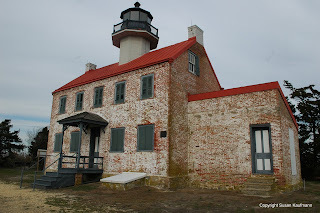 I first found East Point during a New Jersey Lighthouse Society Lighthouse Challenge Weekend. Held every October, these events encourage people to visit all of the open lighthouses in the state. The year I did it, that meant 11 structures that ring the coast starting at Paulsboro at the Delaware River and curving around the lower contours of the state and upward till you get to Sandy Hook at the mouth of the Raritan Bay. Starting on the river side, I visited two sites and was debating the third, which was a good 90 minute drive away near the mouth of the Maurice River. 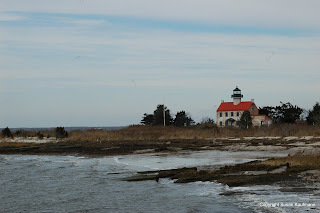 That third lighthouse was East Point, a bit of coastal New England on the shores of Delaware Bay. I was absolutely transfixed on that first visit, even with dozens of people present. East Point is the true middle of nowhere, and it's very easy to stand among the surrounding reeds and the wind, and consider this the edge of the earth. Imagine being the lighthouse keeper there, back in the day when Down Jersey was even more remote than it is today. East Point began service in 1849 and is the second only to Sandy Hook in age among New Jersey lighthouses. Unlike most of the state's navigational beacons, it's a true house with a light on top, rather than a tower and lantern. 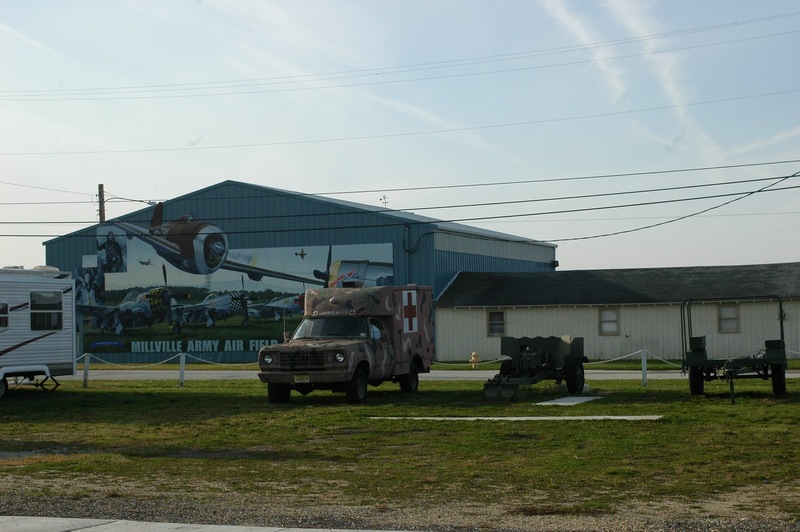 It operated until the start of World War II, when it was extinguished for defensive purposes. Rather than relighting after the war, the Coast Guard deeded the building to the state, whose neglect doomed East Point to damage from the elements and vandalism. Fast forward to the early 1970s, and a group of local residents banded together to save and restore the lighthouse. 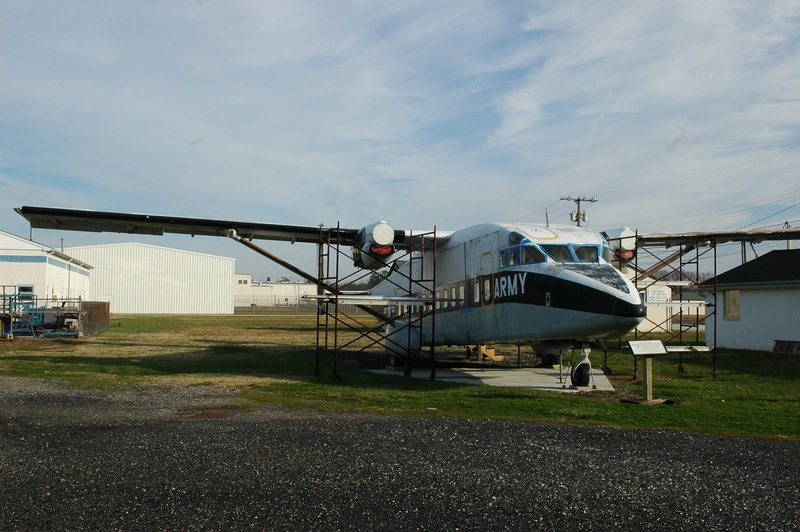 The Maurice River Historical Society has been working to bring East Point back to life, slowly but surely, first replacing the roof and lantern room and then successfully petitioning the Coast Guard to reinstate it as an active navigational aid. I've visited the lantern room a handful of times during open houses, which generally are held on the third Saturday of each month during the spring, summer and early fall. It's been a while so I'm not certain how far the interior restoration has gotten, but on my most recent visit I was happy to see they'd gotten matching grants to continue their work. In a way, though, it doesn't matter that much to me. Don't get me wrong: I'm all for bringing East Point back to its former glory. I just don't go there to see a perfect lighthouse. I go there for the atmosphere. It's the perfect place to contemplate life. The more populated places in New Jersey don't offer a lot of opportunity for introspection. Before you can even start an interior dialogue, you have to block out all of the distractions, and that can be a mammoth challenge. At East Point, you're left with your thoughts, or perhaps with a close friend if you'd like. There's nothing getting in the way, except maybe a fisherman who's just as intent on solitude as you are. I didn't check, but I wouldn't be surprised if cellular service didn't reach that far. Sunsets are beautiful there, as I'm sure sunrises are, too. Horseshoe crabs clamor next to the small boat launch in the spring to lay their eggs, and Monarch butterflies stop by for sustenance and a rest in the fall. The phragmites turn with the season, and the tide goes in and out. The rhythms of the natural world take over, and bring you with them. If you're sick of congestion and crowds and noise, have I got the place for you! Years ago I found Shellpile and Bivalve, twin communities in the larger community of Port Norris, which is, in turn, part of the even bigger Commercial Township. These mollusk-themed places share a common link to the fortunes and downfall of New Jersey's oystering heritage. It just looks as if these boats are sailing on shells. You read that right: New Jersey and oysters. 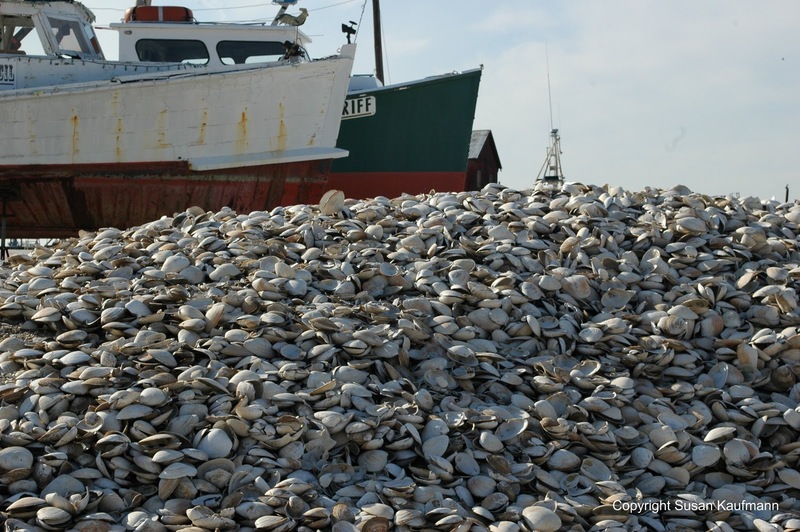 It's not widely known now, but in the first half of the 20th century, Delaware Bay was home to an abundant oyster population and a significant fishing industry to capitalize on it. A vibrant business community settled in Shellpile and Bivalve to harvest and process oysters, shipping them in long freight trains to markets in New York and Philadelphia. The name Shellpile, in fact, refers to the vast mountains of oyster shells dumped outside the processors' factories. Thousands of people lived nearby, mostly in sub-standard housing, filling the demand for labor at all stages of the oystering process. A lethal parasite called MSX (Multinucleated Sphere Unknown) decimated the region's oyster population in the late 1950s, taking the fates of Shellpile and Bivalve with it. Today, a few companies continue to process clams and oysters brought in from other areas, but for the most part, the community has taken on a ghost town-like aura. The only time it livens up is for the annual Bay Day in June. To get to Shellpile or Bivalve, you first need to drive through Port Norris, an experience straight out of a Twilight Zone episode. The streets are lined with homes and the occasional business or government building, but rarely is there a soul to be seen. The place doesn't look especially well-off, though it's definitely liveable. Where is everyone? I wasn't sure what to expect when I visited recently. It had been a while since I was down there, so I didn't know if some of the structures I knew would be gone, but I was pretty well assured nothing would have improved. I'm still hurting from the time I visited to find that the fabled Shellpile Restaurant had been sold. I didn't have the heart to go inside and find out whether the owner had sold his out-of-this-world crabcake recipe along with the building. On this visit, I was pleasantly surprised to see a big red, white and blue banner flapping in the breeze near the waterfront, welcoming visitors. The Bayshore Discovery Project had restored one of the historic shipping sheds, and it was actually open for visitation. When I went inside, two women were engaged in a meeting, busily talking about an upcoming event to be held there. The Bayshore Project people have been in Bivalve for years, as it's the home port for the official New Jersey state schooner, A.J. Meerwald. Formed in the late 80's, the Project organization is responsible for the restoration and upkeep of the Meerwald and use it for a variety of educational purposes. Their larger goal is to motivate people to take care of the environment, the history and culture of New Jersey's Bayshore Region through education, preservation and example. During the summer, the Meerwald offers sailing excursions and summer camps to give kids and adults alike the opportunity to see what life was like on an oyster schooner in years past. Unfortunately, the museum exhibit was closed during my visit, but I wandered through the building and outside a bit to find signs that it's probably pretty active during the warmer months. They even have a raw bar set up, which is enough to get me to return. Outside of the immediate wharf area, Bivalve was very very quiet, looking, as always, like a painting Edward Hopper might have done during a period of severe depression. Old boats up on blocks had obviously not felt salt water lapping their hulls in many a year, and the church building was as shut-up and abandoned as it had been when I first saw it over a decade ago. I took the narrow road through fields of phragmites to check out the Shellpile waterfront and found the same, if not more so. Summertime near the old Shellpile Restaurant is often more active, given the boat launch nearby, but on a Saturday in December, there wasn't much more than a few turkey vultures and a flock of gulls picking through a small pile of clam shells. When I first started visiting the area, I found it eerie. Now I find it curiously calming. Yeah, there's the possibility of a random visitor or resident driving by, but I've never been questioned or confronted by anyone when I was there. Somebody would actually have to be around for that to happen, and it often feels as if I'm the only human being within miles. I was once at an event in Cumberland County where a woman complained to a local that it had been a long trip from, as she pronounced it, "Moooorstown." What ensued was the New Jersey version of "Who's on First," with one person thinking what she said was perfectly logical, but others getting a totally different meaning from her words. It took some time to determine that she was, indeed, from Morristown (Morris County) rather than Moorestown (Burlington County) or Mauricetown (Cumberland County). Depending on who you talk to and where you are geographically, they can all sound the same, but they're distinctly different. 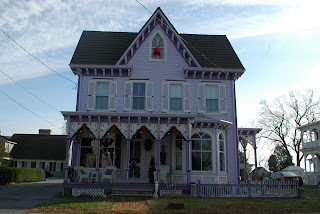 I stopped in Mauricetown on my recent Down Jersey jaunt because I'd heard its streets were lined with vintage homes, many of them meticulously restored. According to The WPA Guide to 1930's New Jersey, Mauricetown was home to nearly 90 seafaring captains between 1846 and 1915. That's still quite evident today, as many of the Victorian, Georgian and saltbox style houses boast signs stating their original owners' names. The town is nestled against the banks of the Maurice River, a convenience the sailors must have appreciated after long voyages away from family and friends. At its peak, the community hosted major shipbuilding activity and contributed significantly to the region's oystering industry. Schooners were a regular sight along the river, but today, all signs of commercial activity on the Maurice appear to be gone. Even a bridge at the end of one of the main streets no longer stands, replaced, instead, by a picturesque park with a couple of benches. There's not a lot going on in town these days, beyond the normal comings and goings and a few antique stores, so I just took a drive around to snap a few photos. 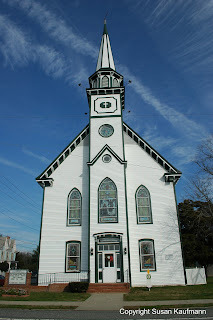 I parked the car to take some pictures of a beautiful white church, and a man across the street suggested I come into his yard for a better shot. He introduced himself as the pastor and asked if I was in town for that evening's Christmas house tour. Residents decorate their homes and some of the other vintage buildings for the holidays every year as a fundraiser for the town's historical society. I was planning to be back on the road home by the time it started, but I'll definitely keep it in mind for next year. Some of the homes are less well-kept than the others, and one, in particular caught my eye. More accurately, the realtor sign in the yard caught my eye. It needs some work, but it's a nice size, four bedrooms, two baths with a little bit of land to boot. When I got home, I checked to find it's on the market for less than $180,000. I have to say: it's tempting. No matter which National Park Service location I visit, I'm struck by a simple fact: the historic buildings that are in use are the ones that seem to better withstand the rigors of time, weather and, unfortunately, vandalism. Leave a building empty, and it rots. Get it occupied with a museum or a business or offices or residents, and it fares much better. The Delaware Water Gap National Recreation Area is a case in point. 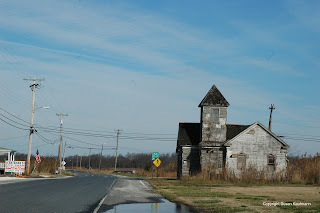 You might remember that back in May, we visited the abandoned town of Walpack Center (check out that post here for an account of why there are so many unoccupied buildings within the boundaries of the park). Like Walpack, Peters Valley was once a thriving little community nestled in the hills, with a general store, church and a few homes nearby. That's where the similarity ends, though, for Peters Valley has been transformed into an artists' community, with resident craftspeople, workshops and a gallery where visitors can view and purchase the art created there. This time of year, the studios are largely quiet, and while visitors can take a self-guided tour during the summer months, when we arrived, we found that none of them was open. The Peters Valley Store, however, was. 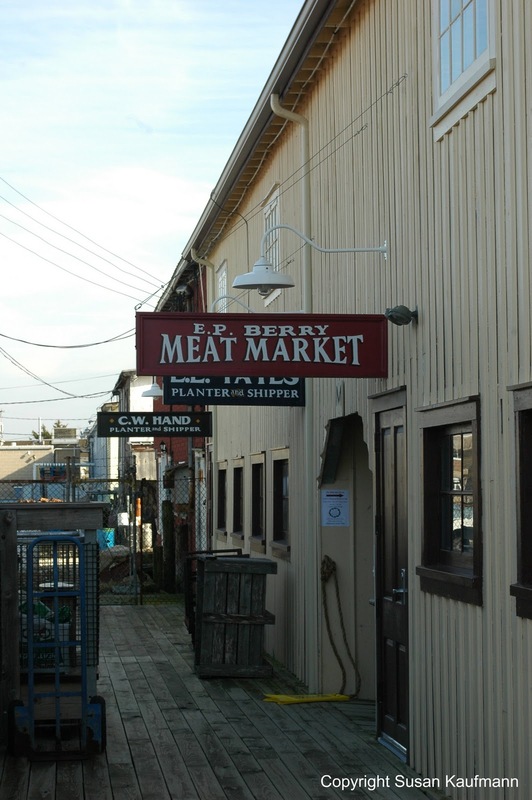 Originally the general store for the town of Bevans/Peters Valley, it contains crafts made by resident artisans as well as others from around the country. I'm generally not a crafts enthusiast, but I liked a lot of what was there -- well made, substantial and reasonably priced (though I'm still a bit dismayed that a great hat I saw cost over $100). The general store is one of several buildings clustered near the 'hens foot' intersection of three roads, two that that T-stop on the same side of the another almost perpendicular, continual road. A National Park Service tour notes a variety of architectural styles that are unique to Peters Valley among the other small communities in the Water Gap. Just behind and to the left of the store is an interesting three-story Greek Revival-style home. The second and third floors are built out to the columns on the facade, making for a rather unique approach to the architecture. Another home on the corner exemplifies stucco-finished cobblestone construction. We walked out a little bit to an old Dutch Reformed Church that hasn't been used for years, locked up but surrounded by a still-active cemetery. A couple of other people were there, decorating a family grave as we took a look at some of the older stones. As expected, many of the names were repeated, particularly Bevans, the name of the postmaster for whom the town had been named. I found a unique metal grave marker which seems to have held up better over time than its stone cousins. Peering into the church windows, I could see several rows of auditorium-style chairs bolted to the floor, as well as a few more modern folding chairs lined up behind them. The interior paint looked pretty decent, but the plaster walls and ceiling were decaying in spots, with big plugs of it resting on the floor. At one time, I imagine, this had been a very nice, though unadorned place of worship, and now it's pretty much left to decay. Looking at this community, even in its dormant state, it's interesting to wonder how long the original town would have remained vibrant had the residents not been displaced by the Tocks Island Dam project. Would people still be farming and working there as their ancestors had, or would most of them been lured away by opportunities elsewhere as New Jersey got more suburban? Bears in the Meadowlands? 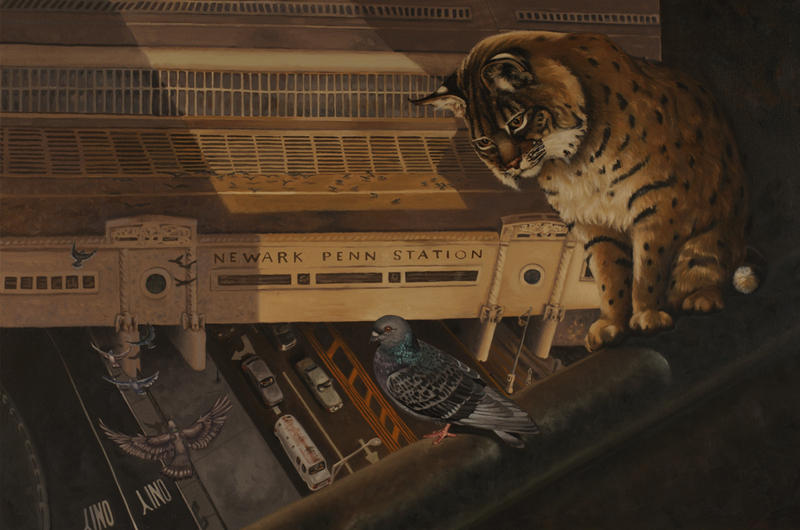 Bobcats stalking pigeons atop a Newark office building? These days, anything seems possible, with a surprising number of species making appearances in the unlikeliest of places. Those examples, though, seem a bit extreme... for today, at least. It seems, though, that I'm not the only one considering the possibility. On my visit to check out the Civil War flags in Trenton, I stopped by the State Museum and found a kindred spirit in the artist currently represented in the New Jersey Artists Series. Tricia Zimic's "Essential Life" exhibit encourages the viewer to consider how the state's original animal inhabitants might adapt to our developed areas. 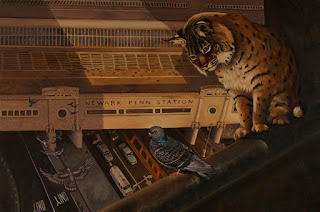 Hence, we see bobcats wandering urban streets and piping plover chicks nested among flotsam and jetsam in a Secaucus marsh. On one hand, it demonstrates a remarkable adaptability of nature to adjust to the stresses mankind has placed on it. On the other, it's a call for each of us to do what we can to preserve habitat, wherever it's needed. I was first drawn into the exhibit by the seeming dissonance of animal against human landscape -- an owl nestled in an I-beam? As I delved farther, though, the sculptures and paintings became none-too-subtle messengers of a simple fact so many people forget: these animals were here before us, and it's our responsibility to ensure they have safe, clean, natural places to live. Most nature art supports that message, but Tricia's work leads you to think beyond the typical forest and water settings to our own backyards, literally and figuratively. Especially in Northern New Jersey, our open spaces are at a premium and whatever we can do to preserve them will have a positive impact for animals, plants and humans alike. In addition to her art, Tricia's working on the reforestation of Essex County's South Mountain Reservation, with more than 40 sites currently in the program. Ivan, as I've mentioned earlier, is working to improve the health of the Hackensack Watershed through Hackensack Riverkeeper. Through these and other organizations around the state, all of us can participate in one-time or extended volunteer efforts to clean up, preserve and restore our environment. Tricia's work will be shown at the State Museum until February 19. 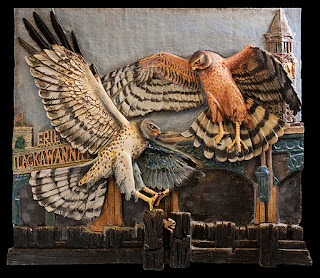 She very graciously granted permission for us to share a few of her works on Hidden New Jersey, and you can check out more of her work and philosophy on her website.